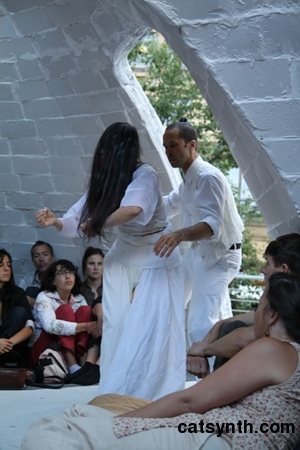 Today we look back at I performance I saw in July, an early performance of “The Line Between” in The Bowls Project, an installation at Yerba Buena Center for the Arts in San Francisco. Although the performance took place in the white domes set up for The Bowls Project, it was really a separate work. The Line Between is collaboration of musicians Jason Ditzian, Suki O’kane, and Frank Lee with Shinichi Iova-Koga and Dohee Lee of inkBoat. Like other butoh performances that I have seen, such as the Emergency (X)tet at the Meridian Gallery in July, it involved very slow and deliberate motion, stark white coloring and an absurdist quality. This performance also including vocals, which was an element I had not heard before. Set against the minimalist musical background of percussion, bass clarinet and portable electronics, the dancers played with the space of the domes and the audience, who sat on various cushions arranged throughout. Some of the motions were very slow and serious, and in time with the rhythms of the music. Others were more playful, such as climbing on the outside of dome. The music provided moments of steady drumming, tonal and extended-technique sounds from the bass clarinet, and bits of noise from the electronics. There were lots of empty and silence spaces in which the dancers could take the audience by surprise. 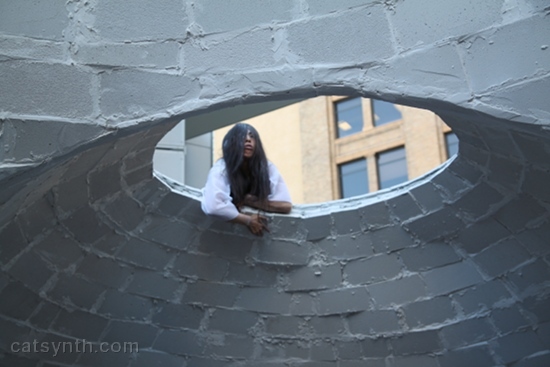 In the two photos looking upwards, one gets a sense of how this unique performance and setting is still situated within the surrounding landscape of the city. Look for one more to appear this Wednesday. Although this performance took place over two months ago, it is in a way a timely review. Dohee Lee will be appearing in PURI 5: “SPoRA” at the Oakland Asian Cultural Center on October 16, an event I am looking forward to attending.